2.5 Axis Milling includes automatic roughing, finishing, thread milling, face milling and single point (drilling, boring, reaming, tapping) cycles. Our patented Automatic Feature Recognition (AFR) recognizes over 20 features, including irregular pockets, taking the drudgery out of the day-to-day programming needs. 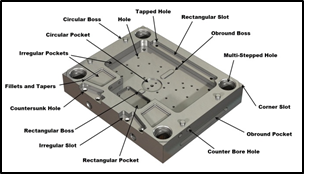 Machining algorithms use the latest toolpath and gouge protection methods to provide fast, error-free toolpaths. Feature recognition, is necessary, but not sufficient for efficient CNC programming. CAMWorks’ ability to associate the best machining strategies with a particular feature using proprietary Technology Database, TechDB™, and recalling them for future programming is the key to reducing programming time by as much as 90% compared to other traditional CAM software. The integrated CAD/CAM environment provides the full toolpath to solid model associativity to assure that any design changes or configurations get updated with a click of few buttons CAMWorks VoluMill™ then completes the package with the ultra-high performance toolpath generator for rough milling operation ensuring that our users are not only programming smarter, but machining faster as well! The standard 2.5 Axis module comes with 4th and 5th axis pre-positioning capability and assembly mode* machining providing users with the best in class CNC programming solutions for the users. CAMWorks offers advanced 3 plus 2 machining support, which gives you the ability to machine various faces of a part, while the software automatically establishes index moves. Multiple machine configurations are supported including rotary tables;rotating and tilting tables; 5 Axis rotating and tilting heads; and horizontal machining centers.Setup for 4th or 5th axis indexing is as simple as inserting an Axis and picking a 0 degree face. Both 2 Axis and 3 Axis machining cycles can be used to machine multi-faced parts or multiple parts. Unique stock shapes can be defined to reduce ‘air cutting’. Significant time savings are achieved by optimizing machining sequences by tool number and index position. CAMWorks simulation displays all the indexing moves for accurate process simulation and collision checking.